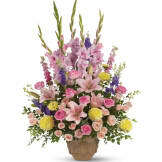 These abundant blooms of pink, yellow and lavender, gracefully arranged in a container, are equally suitable for a memorial service or one's home. 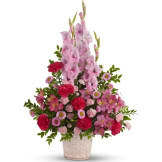 A bright and beautiful way to share your love and memories. 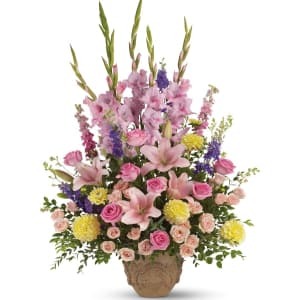 • Fresh flowers such as pink roses, lilies, gladioli and larkspur stems artfully mixed with yellow dahlias and purple larkspur. 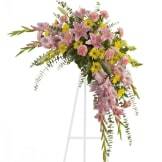 • Arrangement measures approximately 26" W X 45" H.